Obviously, one reason for Keurig coffee machines’ popularity is their practicality. They are very simple and easy to use, and they will give you good quality coffee consistently. Not to mention the wide range of K-cup options available in the market. Below, we’ll help you choose between two great Keurig coffee makers, Keurig K-Classic vs K-Select. Which one is better? First and foremost, the biggest difference that sets Keurig K-Classic and Keurig K-Select apart is the supported brew sizes. The Classic model has fewer brew sizes, and the biggest brew size is not much for an avid coffee drinker. The Select model has been introduced to fill the gap. See also: Keurig K-Cafe vs Nespresso. Keurig K-Classic supports 6 oz, 8 oz, and 10 oz brew sizes. This is good enough if you usually only consume small-sized coffee drinks or something that you can quickly take in a few gulps. However, even the biggest brew size here isn’t much. So, if you are quite an avid coffee drinker who prefer larger brew sizes, you probably will end up still craving for more coffee. 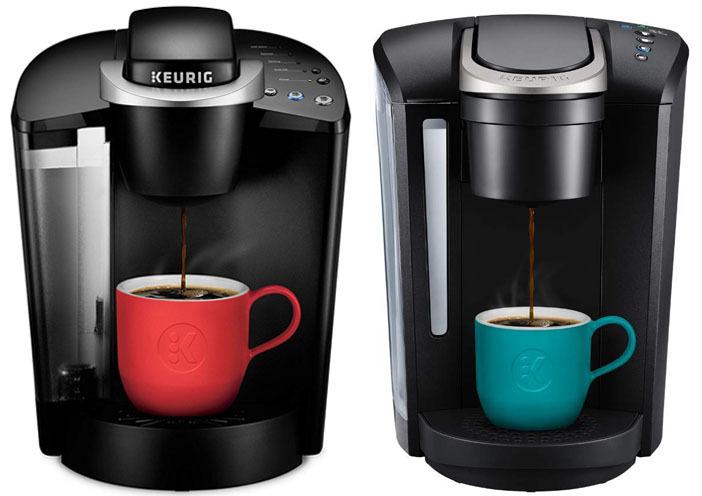 Keurig K-Select supports 6 oz, 8 oz, 10 oz, and 12 oz brew sizes. Hence, it is more flexible and versatile. You can use one of the smaller brew sizes when making a small-sized coffee drink. However, you can also use a larger brew size for a bigger amount of coffee. This coffee maker can cater to the needs of a wide range of people, including those who prefer larger brew sizes. In terms of coffee quality, both Keurig K-Classic vs K-Select are generally great. They both are able to brew good quality coffee with decent flavor and intensity from a wide variety of K-cup pods. However, there is one particular feature that K-Classic lacks and K-Select offers, which is the brew strength control. Keurig K-Classic doesn’t have a brew strength control, so it brews coffee according to a preconfigured setting. This is not a big problem because, surprisingly, the quality of the produced coffee is good. The coffee comes out at a decent hot temperature. The flavor is quite rich and definitely enjoyable. Another great thing about Keurig K-Classic is the fast operation. After you insert the beverage pod and select a brew size, your coffee will be ready within just 60 seconds. So, there won’t be much waiting, and you can get your morning coffee as soon as possible. Still, if you want some degree of customization, this coffee maker is not the most recommended choice for you. Keurig K-Select, on the other hand, comes with a brew strength control. Before selecting your brew size (which will trigger the machine to start the brewing process), you can toggle the “Strong Brew” button on or off, as you desire. When enabled, the Strong Brew function will brew your coffee at a higher intensity to produce bolder, more intense flavor. In the default setting, the coffee quality of Keurig K-Select is similar to Keurig K-Classic. It already has a good coffee flavor. However, if you prefer stronger, bolder coffee, it probably won’t satisfy you. 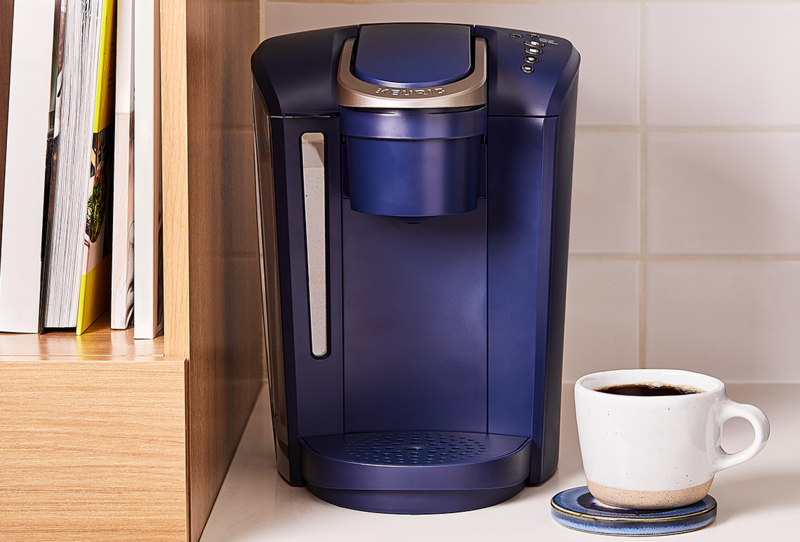 In the Strong Brew setting, Keurig K-Select delivers bolder coffee with enhanced flavor notes. The brewing cycle also takes only 60 seconds. Both Keurig K-Classic vs K-Select have simple and streamlined user interfaces. There are only several buttons that are very intuitive and easy to understand. On Keurig K-Classic, there are only five buttons in total. The first button is for turning on and off the unit. Then, there are three buttons for selecting the brew size. When you press one of these brew size buttons, the unit will start brewing your coffee immediately. You need to load the beverage pod before pressing a brew size button. Finally, the last button is for enabling and disabling the Auto Off feature. When enabled, the Auto Off feature will automatically turn off the coffee maker after 2 idle hours. This is definitely a very useful feature. If you forget to turn off your coffee maker, this feature will help you save energy. There are also several light indicators that are clearly labeled. The machine will tell you when it needs descaling or when you need to add more water into the reservoir. On Keurig K-Select, the user interface is also very simple and easy to understand. There are six buttons in total. However, the Auto Off button has been removed. The unit still has the feature, but you need to go through a series of commands to enable or disable the feature. It is enabled by default, and will automatically turn off the unit after 2 idle hours to save energy. Under the power button, there are three light indicators for auto off, add water, and descale. Beside the indicators, there is the Strong Brew button. Finally, under the indicators, there are four buttons that correspond to the supported brew sizes. Likewise, this coffee maker will start brewing immediately when you press one of the brew size buttons. The next difference between Keurig K-Classic vs K-Select is the water reservoir capacity. As a rule of thumb, the bigger the reservoir of the coffee machine, the better it is. It won’t need frequent refilling. Make sure that you get a coffee machine with a big enough reservoir if there are multiple coffee drinkers that will use the unit. 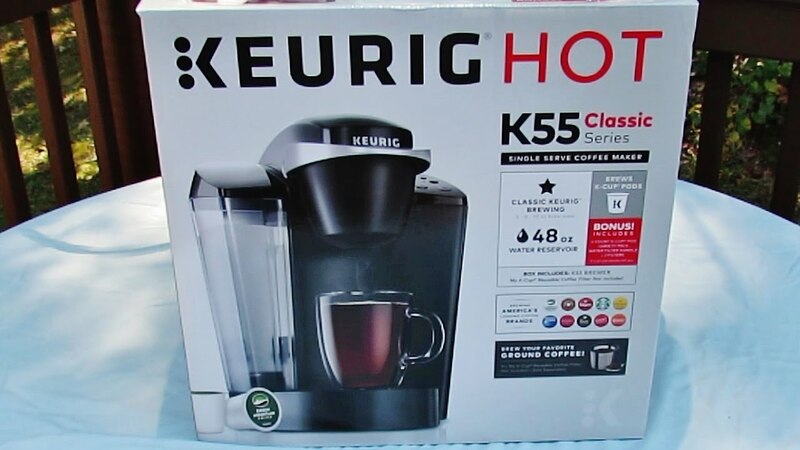 Keurig K-Classic has a relatively smaller water reservoir capacity, which is ‘only’ 48 oz. Well, to be fair, this is actually already quite large. It can brew 5 – 8 cups of coffee before it needs to be refilled. Of course, the water reservoir is removable for easy refilling. You can take the tank out from the machine, fill it with water until the ‘max’ line, and put it back into the machine without any problem. Keurig K-Select comes with a larger water reservoir. The capacity is about 52 oz. Well, the difference is not that much, but still a good thing, especially because this model has a larger brew size. The increased capacity may allow you to brew one more cup of coffee before refilling. On average, you can brew 5 – 9 cups of coffee from a full tank. The water reservoir is also removable for easy refilling. Finally, one notable difference between Keurig K-Classic vs K-Select is the dimensions. Interestingly, despite the slightly smaller water reservoir, the K-Classic model actually has larger dimensions than K-Select. This is something to consider if your kitchen doesn’t have much free space. Keurig K-Classic measures 13.3 inches tall, 10.1 inches wide, and 13.2 inches deep. When the top lid is opened for inserting a K-cup pod, the total height becomes 17.6 inches. The water reservoir is located on the left side, so you need to give some free space there so that you can easily remove and put back the water reservoir for refilling. Keurig K-Select measures 12.5 inches tall, 9.2 inches wide, and 11.6 inches deep. The water reservoir is also on the left side. When the top lid is opened, the total height is 17 inches. Since the dimensions are slightly smaller, this model is more space-friendly and more recommended for small kitchens. Both K-Classic and K-Select are equipped with removable, dishwasher-safe drip trays. You can easily take off the drip tray when it is full and dump the content into your sink. It will gradually develop residue, but you can wash it in a dishwasher for easy and simple cleaning. Descaling is essential for both K-Classic and K-Select, and practically any coffee machine. Through the months and years of usage, the coffee machine will build up mineral deposits in its internal parts. You need to remove the build-up every once in a while if you want the coffee maker to last. The light indicator will tell you when you need to descale your coffee maker to remove mineral deposits, so you won’t forget to do so. You can use the Keurig descaling solution and follow the instructions provided in the manual. It is recommended that you use filtered water with these coffee machines. However, you can also install a water filter in the reservoir. Keep in mind that the water filter will need to be replaced every 60 days. Stocking some water filters is a great idea so that you won’t need to re-order for some time. - Brews multiple K-Cup Pod sizes: (6, 8, 10 oz.) – The most popular K-Cup Pod brew sizes. Use the 6oz brew size to achieve the strongest brew. - Large 48 oz. Water reservoir: allows you to brew 6+ cups before having to refill, saving you time and simplifying your morning routine. The water reservoir is removable, making it easy to refill whenever you need to. Both are good coffee machines, but Keurig K-Select is better and more recommended. It has a brew strength control which will allow you to adjust the coffee intensity to suit your liking. It also supports more brew sizes up to 12 oz, so it is great for avid coffee drinkers. Furthermore, it has a larger water reservoir and more compact dimensions.